The roller bearings are built into the wheel hub and look just like ones made from hardened steel. [Alessio]’s cellulose of choice was Lignum Vitae, a self-lubricating wood that is also the hardest grown and available for sale (among those labelled “ironwood”). After drafting the wheels and bearings in Rhino they were cut using a 3-axis CNC milling machine and assembled. Sadly, during the race [Alessio]’s driver managed to crash the kart – twice, maybe it was all the extra speed – so they did not win this year’s Carettella. [Alessio] has his eye on victory next year – enough that he is keeping the actual specs of the design to himself. Below are 11 magnificent seconds of [Alessio]’s kart run, and some footage of the Artena festival. (Skip to 1:40 for the racing). ** Update – As several astute readers have pointed out, there is clearly steering. The front wheels are mounted to a plate that pivots in the middle of the kart, as controlled by the driver’s feet. Oops. *** Update – One of our Italian readers has translated that the official rules allow only for a metal steering pin, likely to prevent teams from kartwheeling if a wooden one snapped. Also, while metal parts are not allowed, fasteners like nails and screws are, as subject to judge’s inspection. All that smooth riding caused by those bearings made the site easier to crash. …you DO know what this gesture means in Italy? … Not until I looked it up. Apparently this is only in the region of Sardinia. Not all of Italy. Apparently many people from Sardinia have never even heard of this. Apparently in modern culture everyone is well aware that it’s a sign of approval, it’s on Facebook, everyone watches Hollywood movies and TV. What a delightfully obscene double-entendre coincidence I wish I could take credit for. @Matt if only your name had one less ‘n’ and it would be even better. The only other time I have seen wooden bearings like that was in a Leonardo Da Vinci museum exhibit, though I think those were ball bearings instead of rollers. Kudos to the Italians for thinking outside of the box! Alessio is a bit late in terms of inventing wooden roller bearings, since Alessio’s very own countrymen in the same town were familiar with tapered wooden bearings around 2000 years ago, judging by archaeological finds involving pleasure craft on the bottom of Lake Nemi, which seems to be in Alessio’s very own neighborhood. They seem to have pivot-axle steering – a rigid axle pivoted in the middle and pushed to turn left or right with the feet. It’s possible that I was wrong, but I looked, and I couldn’t see evidence of it. I watched a handful of other races and I don’t see the wheels turning at all, either individually or on a central pivot. I’m curious now, where do you see them pivoting? Good catch. They clearly articulate. My bad. I’ll go make an update. … Summarizing: The “carettella” must be built all in wood, the only part that could be iron is the steering pivot, and also nails, bolts and screws. The “carettella” will be chececk by judges. I’ll trust you. Update #2 made to point out about the steering bolt. Had a suspicion about that one. Back to the Colosseum with you and your reasonable logic! OK, now some town with a quarry has to go full Flintstone with carts made entirely of granite. I do not watch Holeywood movies or TV! So axle grease is a nono? To be honest, it was a stretch to interpret my google-translated Italian with their not-as-a-first-language English. Maybe we should have met in the geographical middle and communicated in more passable French or German. “Not a spec of anything else” might have been an overreach on my part. I mean, they’re clearly painted for one. But then they are “only wood” enough to necessitate machining bearings from exotic timbers so.. *shrugs*. Now that I see that the front wheels steer I have to wonder if that pivot pin is also wood or whether they made an exception for something that would kartwheel the team down the pavement if it snapped. The helmets aren’t wood either if that counts. I also spotted a metal bolt on his brake levers.. I’m guessing they like reliable brakes! Maybe it was just painted to look metallic. Maybe you caught a cheater. Maybe you’re just making me look bad. I was joking. We’ve already seen that the steering pivot can be made from metal, and the rules allow for minor fasteners like nails and screws. You might be right. Since his website is down you can’t see, but, one of the big reasons for choosing Lignum Vitae was because it is naturally self-lubricating. Part of what makes me think that grease is not allowed or it wouldn’t’ve mattered. Lignum Vitae rates #2 on hardness, requiring 4,390 lbf (19,510 N) of force to embed a 0.444″ steel ball halfway into the surface. But oddly, the wood only comes in at #5 on the weight scale. Lignum Vitae was (is?) used for the bearings for submarine prop shafts. Knowing that, I wouldn’t even consider another species. It is as you say CITES protected. I do not think it used any long for submarine shaft bearings but I do know that the USS Nautilus used Lignum Vitae bearings. I believe the rollers are made in Lignum Vitae. 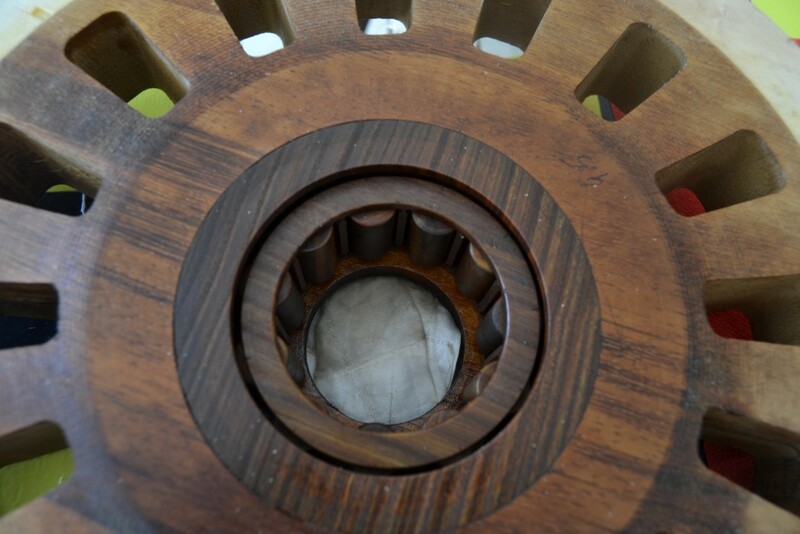 Oak is used for hydroelectric turbine bearings. Big ones. The problem I foresee is tyres/wheels splitting along the grain if the streets are too bumpy or uneven. I would hazard a guess that long strips of veneer glued around the rim could form a functional tyre, at least that way there wouldn’t be any directional grain which could fail. I would have used a planetary gear.. I would make the tires from thin wedges of veneer glued into a wheel. That would provide the flexability needed for a decent contact patch. I love the wheels you made. Do you mind sharing how you imbed the bearing into it so securely? Would you be open to sharing your cad drawing as well? I can pay if needed. I am wanting to make a similiar project.